The Finland based trendsetter in mobile crushing and screening attachment technologies Allu, used Intermat to launch its new mobile ‘app’, which provides operators with a wealth of information concerning the attachments they use. Apart from a detailed description of the tool, the ‘app’ matches the attachment to the base machine, links the user to a nearest Allu dealer and enables access to installation and operational guidelines. Intermat is located in the homeland of French manufacturer Arden Equipment. This was evident from the large number of contractors that visited its indoor and outside area booths, where visitors could also enjoy interesting equipment demonstrations. Of particular interest was the multi-processor with a very efficient dust suppression system. The US company is a manufacturer of a variety of equipment including hydraulic cutting and milling heads, roadheaders, saw attachments, possessing a growing profile in the industry. Located in Maryland, the company is now pushing strongly into the European market, and possesses products that we are going to see a lot more of in the European market. US company Fortress’ presence was for nerds in the demolition and scrap business the biggest news at Intermat. The company is quite young, but the people behind it have decades of experience, with Bruce Bacon, the founder of the Genesis Attachment’s, and now the president of Fortress, being particularly of note. It will be very interesting to follow Fortress in the future, following on from the company displaying some of its new scrap shears, multi-processor and crushers at the show. Italian attachment pioneer Mantovanibenne, had two reasons to celebrate at Intermat. One was the establishment of the Group by Alberto Mantovani 55 years ago, and the other the 20th anniversary of its French subsidiary MBI France. Product wise, the highlights were the CC60R combi crusher, the redesigned MS (multisystem) attachments and the SGR demolition grapples. Weighting in at 6.5t, the CC60R comes equipped with two oversized cylinders and central twin pin system, enabling larger openings and greater crushing force. The tool’s main feature, however, is the asymmetrically shaped jaws allowing cutting steel like scrap shears and crushing concrete at the same time. The MS multisystem line was upgraded with new jaw sets, including interchangeable ones, and with new cylinders. The SGR series of demolition grapples received a new hydraulic system, specifically adapted for heavy duty demolition and rock crushing tasks. Montabert introduced two new heavy rock breakers: the V6000 and the V7000. These weigh 6t and 7t respectively, and complete Montabert’s range to equip carriers up to 120t. Three patents have been filed for the two new breakers: the first is related to the hydraulic cushion and piston centring. The two others are linked to the new variable energy adjustment system. In common with many other Montabert breakers, the V6000 and the V7000 are able to adapt their striking energy to the hardness of the rock, and include Montabert’s dual lubrication circuit. The classic features are also in built, including pressurization and housing with reinforced steel. Moreover, the breakers have been specifically engineered to provide ergonomics and safety for the operator. and any people working close to the breakers. Wear parts are easy to change, and have been designed with weight limitations and serviceability in mind. Noise levels have also been reduced to minimum levels, using a fully sound proofed housing. Another major Italian manufacturer had an important message to deliver at Intermat. Founded by the legendary Nerio Vaccaro, VTN Europe marks its 45th anniversary this year. To underline the importance of the coming event, the Vicenza based company launched a new slogan and logotype at the show: ‘A different way’. This is a motto signifying VTN’s commitment to constant evolution and the watershed between past and future. VTN’s story is that of perpetual change and innovation, which the message, new logo and motto are designed to convey. CMB, the attachment specialist from Veneto, Italy, exhibited in Paris a range of excavator attachments designed for demolition and forestry professionals. The main attractions were the fixed and rotating crushers FF18 and FH16, featuring a fully protected cylinder, interchangeable blades and teeth, and the CR shears with a 360° rotation function. Another popular exhibit was the PW deforestation shear. Thanks to its 360° controlled hydraulic rotation, a secondary arm for multiple cuts and replaceable blade, this model is reported to be popular with users due to its versatility and productivity. Sennebogen announced the extension of its range of material handlers with the addition of the 855 E hybrid model. Driven by a powerful Tier 5 compliant 231 kW diesel engine (a Tier 3a version with a 224 kW electric motor is also available) the 855 E hybrid effectively fills the gap between the existing 850 E and 860 E models. It uses an energy recovery cylinder mounted on the boom between the two hoist cylinders which offsets the weight of the boom, reducing energy costs by up to 30%. This additional hydraulic cylinder stores the energy produced when the boom is lowered in compressed gas cylinders located at the rear of the machine. This accumulated energy becomes available for the next lift. The manufacturer’s E series machines come complete with an elevated cab as standard, with the proven ‘Maxcab’ being now 70mm longer. Further improvements include repositioned air outlets, armoured glass, optimised sound insulation and the in house developed Sennebogen joystick. At Intermat, the Spanish based manufacturer of compact material handling equipment unveiled what is said to be the industry’s first electric dumper featuring a driver's cab. The new machine is powered by a 13kW electric unit, ensuring 6h of continuous operation with maximum productivity. Equipped with an external transformer, it can be plugged directly into the 220V mains (220V), with the charging process being completed within just 5h. The dumper’s loading capacity of 1t is the same as the base model. Brokk has this year undertaken its biggest product release ever with four new products: Brokk 170, Brokk 200, Brokk 300 and Brokk 520D. A full report on the new products may be found on pages 36-39. Together with Brokk, German demolition attachment manufacturers exhibited some of their latest developments. 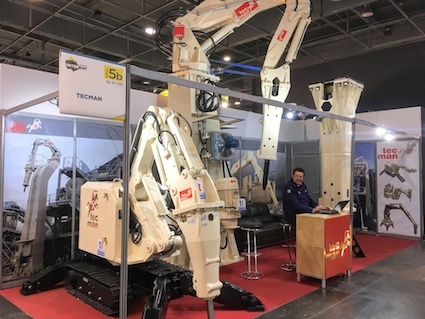 France based attachment specialist Tecman announced its entry into the demolition robot business with its own in house developed model, the Rocbot 2500. The family owned company was founded by Luc Templier to manufacture rock breaker booms, hydraulic hammers and other excavator attachments. The company has now evolved into a major player in the market with three factories in France, and a dealer network servicing five continents. Tecman’s robot impressed; weighing in at 2,7t, the demolition robot boasts overall dimensions of 2,556m x 2,136m x 1,669mm (L, W, H). The Rocbot is powered by a 22kW three phase electric motor, with its Tecman ‘OptiStab’ stabiliser system ensuring the machine is stable during operation. The demolisher can carry a 450kg hydraulic hammer or 305kg drum cutter that can be easily exchanged with an OilQuick automatic coupler. Husqvarna had a large presence in Hall 4, where a large cross section of it product range was exhibited. This included diamond tools, concrete cutting equipment, demolition robots and concrete floor grinding equipment. The light construction equipment range that was recently acquired from Atlas Copco was also displayed. Komatsu Europe extended its line-up of hybrid excavators with the introduction of the HB215LC-3 crawler excavator at Intermat. Powered by an EU Stage IV emissions compliant engine, the HB215LC-3 boasts all the classic features of a Komatsu excavator including the latest ‘Komtrax’ telematics, advanced Komatsu hydraulics, and new integrated attachment control system. Komatsu’s hybrid system is built around the electric swing motor/generator, with the hydraulic power normally directed to the swing system being instead used to power the boom, arm and bucket, leading to improved performance. The energy from swing deceleration is captured and stored in an ultra-capacitor for use by the electric swing motor or engine mounted motor/generator to assist engine acceleration. The ROPS certified cab, specifically designed for hydraulic excavators, benefits from a reinforced box structure. Turkey based Hidromek used Intermat to showcase two new mid-range crawler excavators, the HMK 60 CR and HMK 145 LC SR. The machines have been designed with operator’s comfort in mind, with the mid-range HMK 60 CR boasting all the comfort features of Hidromek’s heavy duty excavators, including ergonomic console, coloured TFT display and electronic control units. Thanks to Hidromek’s patented interface system ‘Opera’, all functions on the HMK 60 CR are at the operator’s fingertips. The HMK 145 LC SR crawler excavator also features the ‘Opera’ system as well as a tilting cabin providing access to all hydraulic lines for easy maintenance. UK based Perkins Engines confirmed its ongoing commitment to the Stage V programme by rolling out six new engine models at Intermat. These comprised of the 1700 series, the 2200, 2400, 2600 and 2800 series and the Perkins® Syncro 2.8L and 3.6L. Meeting the EU Stage V emissions regulations has not been particularly challenging for Perkins, which has been using it in off highway machines for many years. The company states that 500,000 machines run on construction sites, which have accrued nearly 900M hours. Later in 2018, Perkins will introduce a range of engines below 19 kW without the need for exhaust gas recirculation, electronic controls or diesel particulate filters. Germany based Motorenfabrik Hatz showcased its new H series three cylinder diesel engine, the Hatz 3H50T. This is characterised by small size, low weight, with high performance and power at low speeds. Compliant with the EU Stage V emission standard, the engine has a maximum output of 18.4kW, achieving the emission requirements without any exhaust emission after treatment system, such as diesel particulate filter (DPF), exhaust gas recirculation or diesel oxidation catalyst (DOC). The Hatz 3H50T is a high torque engine with a displacement of only 1.5l and an output of 130Nm. The 3H50T is also available as an OPU (open power unit) option. Also new from Hatz was its ‘Smart Parts programme’, making it easier for dealers and customers to access aftermarket care. The manufacturer of all kinds of floor preparation equipment, Blastrac, displayed its latest products in a large outdoor booth, including the giant three headed floor grinder for really heavy duty floor grinding. 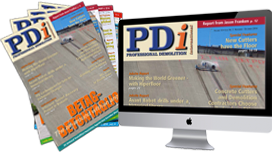 Also shown was a large selection of the latest models of smaller floor grinding and polishing machines as well as the latest dust extractors, which can be read about in the special feature in this issue. As one of the leading names in this sector, Husqvarna proudly showed its vast range of diamond tools, concrete cutting machines, dust extraction equipment and some of the floor grinding machines and tools from HTC, including the new Duratiq 5. Tyrolit exhibited at two booths. In the indoor booth, a variety of diamond tools, concrete cutting machinery and floor grinders were displayed. Outside, the latest developments were demonstrated including the new high cycle, heavy duty wall saw. This can be read about in our special feature on new wall saws located at the rear of this issue. Steelwrist is well known for its tiltrotators and various kinds of attachments for all kinds of construction machines. Recently it has released a development of particular interest to the demolition industry, a new quick coupling system specifically for demolition and recycling. This enables the operator to remain in the cab and easily change attachments in seconds. Read the full story about Steelwrist on pages 34-35.